Wow, it has been about two weeks since I wrote a blog. In those two weeks I've been to Tucson for work with the Triabetes club, rode the Ironman Arizona bike course in Tempe, saw my Grandfather for his 90th birthday and had another good weekend of training. While riding the Ironman Arizona I ruined a rear training wheel blowing out two tires and lost my Dexcom receiver (Yes, I said it, lost the Dexcom receiver, epic fail). Let's just say I'll have to ride the course again before doing the race due to how I left it this time. I've also decided I will coach myself creating my own training plan going into my first A-race of the season, the Epic 125 in Las Vegas in late May. There are now twelve weeks until that race so I am about to go into the "build phase" of training. I believe I will learn much more about my body and what I know about training by creating the rest of the plan from here on out myself. Will I make a few mistakes... sure will but I will learn a lot more about training from this than just following a general training plan. Wanted to share this interview with the winner of the "Triathlon Winter Championship". Why is this any different from any other? Because this gentleman is just a normal "age group" athlete. Wait, did I say normal? He's the Assistant U.S. Attorney in Montana. That's not your "normal" job. He runs 120-160 miles a week which amounts to 18 to 25 hours of training. His key points to how he manages it all are a great reminder for everyone. "Balance?? Serious discipline, serious time management, and sacrificing other things in life. Plain and simple. You either do it, or you don’t." I'd like to think I have a lot of discipline but Mr. Wolfe's quote is a good reminder of what needs to be done to obtain serious goals. Time management, sacrifice (or what could be called "eliminating noise") and just plain doing it. "The disciplined athlete will make daily sacrifices and make due with hardships in order to excel. This person doesn’t miss workouts short of a disaster. Weather is an insignificant factor. The disciplined athlete knows that the small stuff is important. He or she doesn’t get sloppy [...] Humans are social animals; we don’t like being outcasts. It’s much easier to go along with the crowd than to stand out in a crowd. [...] Discipline is not easy." -Joe Friel, USA Cycling certified Elite-level coach, and founder and past Chairman of the USA Triathlon National Coaching Commission. In writing this blog I found it needed to be separated into two parts. The first about cycling and the second about the race today. In finding myself through triathlon I've come to love cycling. Swimming isn't as bad as I once found it. I like masters swimming and going to the pool with Jamie on weekends. I also find it a personal accomplishment starting near the bottom to where I am now. The low impact on the body is wonderful and the "workout high" is great. However, I'll never be truly good starting at this age and some days are just a struggle. I feel like running is a time bomb. As if I'm just waiting for the next time I will be injuried. If I found a genie in a bottle, one of my three wishes would be to run forever with no threat of injury, until that point running scares me. Being disciplined in heart rate training and stretching has kept me feeling good but being 6-2 and near 190 is a lot of stress on the body from the pounding running brings. Cycling is beautiful. La souplesse, a French term which in short means being one with the bike. On the bike you can go so hard; heart pounding, quads, burning and it actually feels great. Alright fine, it's masochism, but it's controllable, manageable. Just you and the crank, pushing up the hill or hard through the flat. Not to mention the diabetes is controllable on a bike. I always know where my blood sugars are going, if it's too high a bolus is easy and if it's too low eating is simple. While running and swimming offer a lot of great things, it's cycling that I love the most. Running and swimming can be done out of town, when bringing a bike isn't the best option. Running is easy, just shorts and shorts. Swimming is like that too but it's technical. So the other sports are great in their own respect but still can't compete. The best part of cycling? The "hardcoreness" as I would call it. Races aren't parties, it's about doing well. Cyclists take it seriously, very seriously. Weight matters, energy matters, it might be a hobby for most but it's still serious. Fun but serious. All of this brings me to my first cycling race. 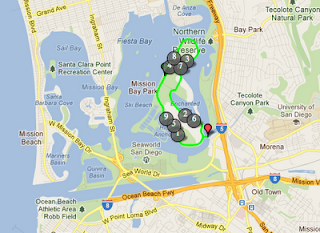 The Fiesta Island Time Trial. It's a 20km (12.4mile) three lap course around Fiesta Island in San Diego with riders starting every thirty seconds. Go as hard as you can hold for the 20km. So how'd my first race go? A lot like the first time you do anything, do the best you can, take the lessons and make it better the next time. Overall, I would say it went great. I know I can do a lot better next time but for the first it went well. I love the thrill of a time trial, just speed, going fast and hard. I screwed up my blood sugars in the morning before the race however. I can honestly say I've never had a short race where I haven't destroyed my blood sugar, for longer races such as a half-ironman, I really think through a plan for nutrition and insulin. For a short 5k run or something like this I haven't done the same. It's time to start thinking through these mornings to get the blood sugars nailed. I finished in 32:30, just under 23mph. These races happen each month so my goal is to get the time under 30 minutes. A little bit longer warm up, clear the blood sugars up and even more speed training. Will it all help my Ironman goal? Heck yes it will. Each race is a learning experience. Don't get me wrong, I love triathlon but I love being on that bike the best. 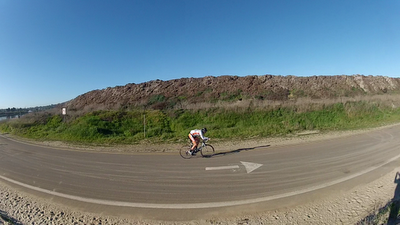 I look forward to doing a lot more bike races in the future. This year I will only do the time trials (Fiesta Island has them just about every month) but next year after Ironman you'll definitely find me at a few criterium and road races. To Jamie; thanks for being there again early in the morning to support me. I love you.